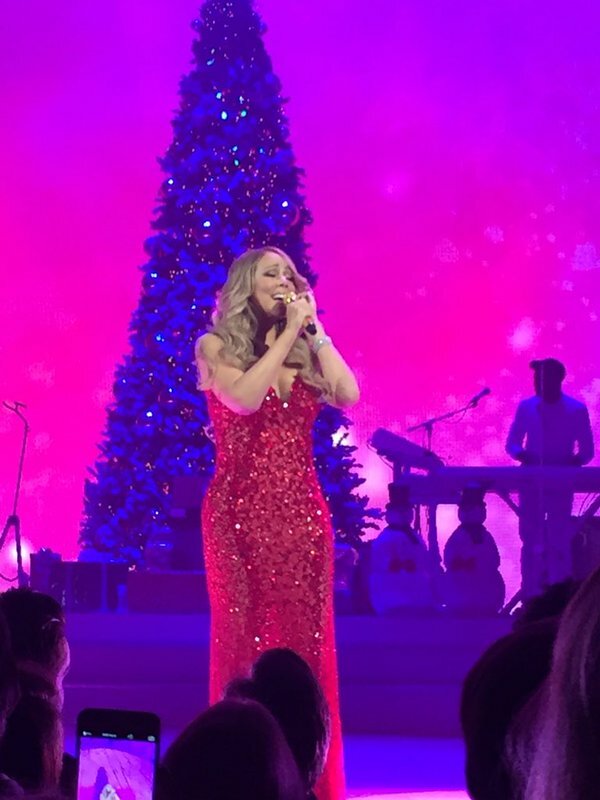 In the 21 years since the release of her 1994 original, and now classic, holiday anthem “All I Want For Christmas Is You,” Mariah Carey has slowly but surely made herself a ubiquitous part of the Christmas season. Or, shall we say, we have made her such. Most prominently since the song’s ten year anniversary in 2004, she has begun to pop up each holiday season to celebrate the festivities and remind us of her timeless classic. About since the same year, “All I Want For Christmas Is You” has danced around the top spot of Billboard’s Holiday charts. So, it is only fitting that, last year, she kicked off an annual Christmas residency at perhaps the most festive city in the world: New York. 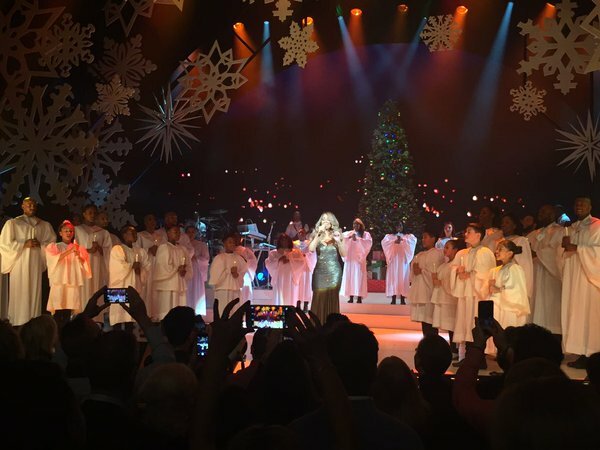 The spectacular residency calls the Beacon Theater home, and last night, its reigning holiday diva made her glorious return to its prestigious stage. Perhaps feeling the pressure of tradition during this most traditional time of the year, Mariah stuck to the old sentiment of “if it ain’t broke, don’t fix it,” and kept the setlist exactly the same as last year’s. Aside from minor changes in arrangements and new vocal ad-lib moments (it’s all about the moments, dahhhling, after all), the show is indeed a repeat of last year. Would we have enjoyed some new songs added to the set? Of course. However, the repetition of last year’s show gave that certain sort of warm and fuzzy familial feeling that comes with other holiday traditions. Like with our favorite old songs and favorite old movies, we know what to expect and we like what we get. Imagine, you heard she performed “Hark! The Herald Angels Sing” last year, and came to see it this year, and she didn’t do it? You’d be upset, I am sure. 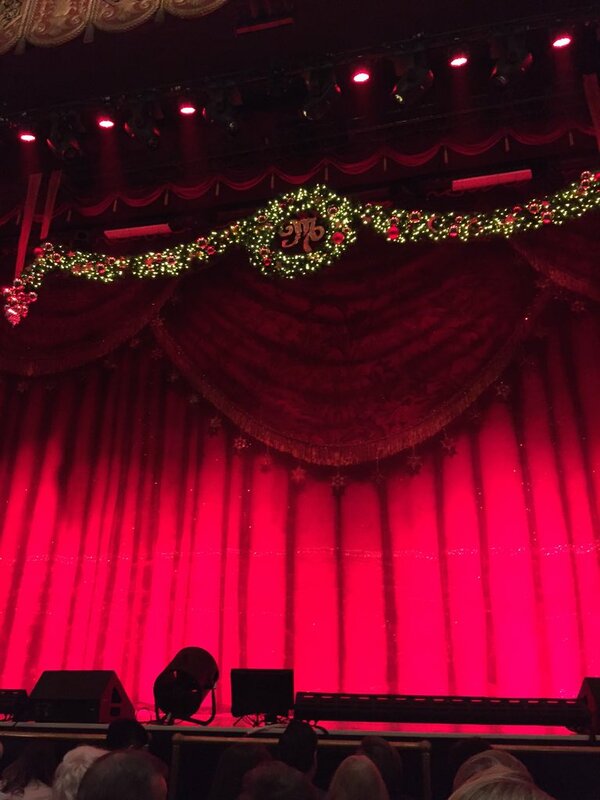 So, in that way, Mariah’s unchanged show aims to be yet another irreplaceable Christmas tradition. So, please, Mariah, don’t take anything away… but feel free to add more. Of course, then, there is the question of her many naysayers: how did she sound? Well, first, let me say that if you are going to walk into the show expecting to hear 20 year old 1994 vocals performed in a studio by a 24 year old, you will, of course, be disappointed. However, if you are a realistic person with any semblance of sense and humanity, you will go into it expecting to hear what is the reality: it’s 20 years later, she’s 45, and no, she doesn’t sound the same. Guess what, though? She still sounds great and better than 95% of anyone who could be considered her “competition.” Were there off notes? Did she avoid attempting some challenging moments written into her originals? Sure, but such instances were few and far between. Aside from these few instances, Mariah went for it, gave it her all, and delivered a great vocal performance that will only improve as the residency goes on and she becomes more comfortable, just as she did last year. By the eight night, undoubtedly she’ll be prancing around the stage, sleighing in the name of the “One Child” himself. She began with “Hark! The Herald Angels Sing” for an understated, and eventually bombastic, impressive opening number. Flawlessly transitioning from that more traditional religious moment, she moved into “Charlie Brown Christmas,” which begins with the classic Peanuts piano tune and a celebratory moment on stage. The uptempo fun continued on the energetic “Oh Santa!” followed by “Christmas (Baby Please Come Home),” a cover that many now attribute to be her own. “Silent Night,” which isn’t one of my favorites on CD, makes for another beautifully impressive performance. “Joy to the World” is the first standout moment of the night, as she kicks it off with its famous piano-and-vocal intro where she really just goes for it vocally. Following “Joy,” is her new, should-be classic “When Christmas Comes” from her second Christmas album. 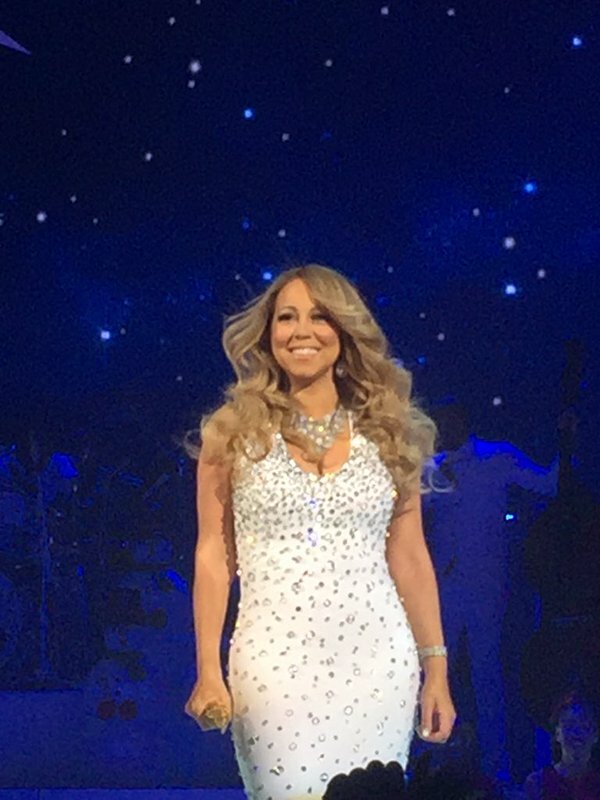 Personally, it’s one of my favorites and I was really excited to hear it again – so much so that Mariah took note and pointed at me, saying something to the effect of “I see you know this one, huh? !” and proceeded to sing the entire first verse to me. At least, you know, that’s how it felt to me (she was definitely looking in my direction after pointing me out – all I’m saying). After “Christmas Comes,” then Santa comes to town for her hip-hop inspired “Here Comes Santa Claus/Up on the Housetop” groove. 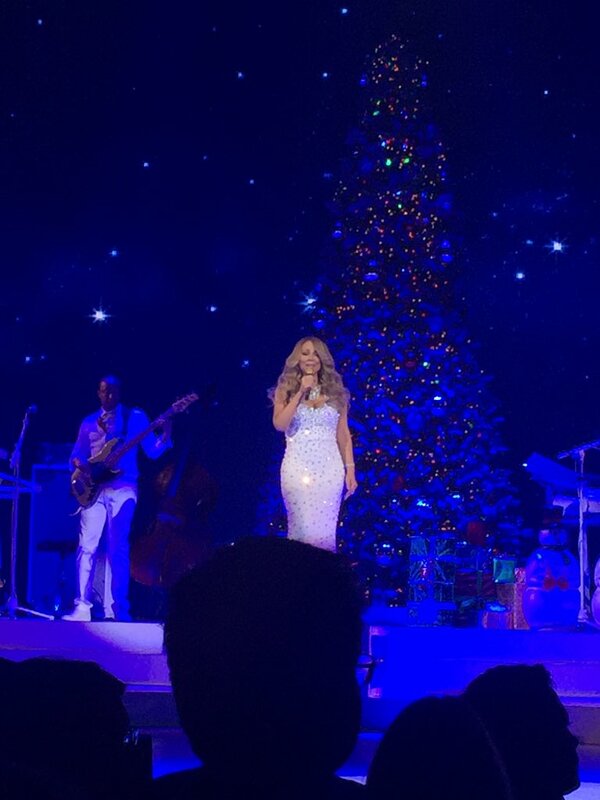 Santa came to stage carrying presents, because, after all… Mariah and Santa are old pals. Last year, Santa twerked, though… this year, he didn’t, however he was a much more legit in appearance this year. Another favorite from Merry Christmas II You, “Christmastime is in the Air Again,” came next and Mariah effortlessly sang her way through this jazzy number. The night seemingly came to a close with the ever-appropriately show-stopping “O’ Holy Night.” Following the traditional classic, she took the stage to perform a few of her non-Christmas classics: “Emotions,” “We Belong Together,” and “Hero.” Of these, “Emotions” is the standout for its fun energy and effortless vocals. “Hero” was, as usual, a touching moment and Mimi teared up herself. Finally, she of course closed the night with her signature Christmas classic that started it all: “All I Want For Christmas Is You.” Complete with a snowman, teddy bear and a slew of other holiday characters, she took the stage to reaffirm her status as the Empress of Christmas. And, since Elsa was nowhere to be found… Mariah took it upon herself to “Let It” Snow. 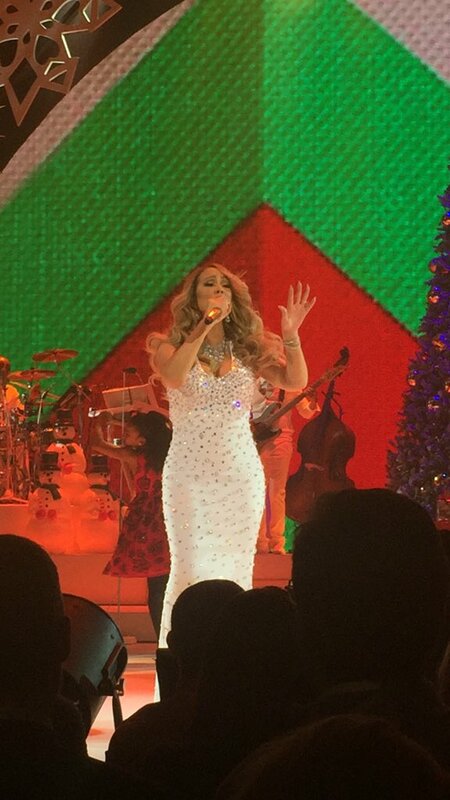 Confetti was not enough, dahhhlings, it’s Christmas, and Mariah had to make it snow! She did promise, after all. So, indeed, if you like Mariah’s Christmas music, or just Mariah in general… you must go see this show. If you love Christmas, go see this show. Not only does it feature great vocals and some great songs, but it also is wonderfully festive and entertaining… without a doubt, it will put you in the holiday spirit. Head over to our Facebook page to see more videos from opening night. More will be added tonight, as well, because I’ll be there again! Also head to Mariah’s website for additional info on the remaining shows and tickets.